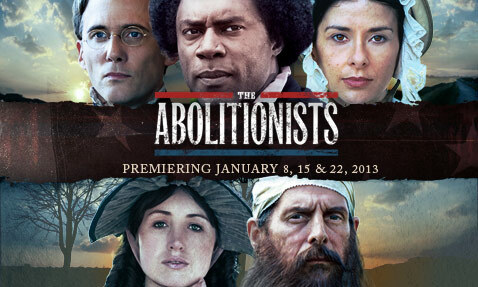 Many people do not know who the abolitionists were or what they did. They were a small group of people who were determined to eliminate slavery from the United States. PBS is presenting a 3 part mini series starting tonight based on two of them: Frederick Douglass and William Lloyd Garrison. These two men came from very different lives but both had the determination to eliminate slavery no matter what the personal cost to them…including their lives and family. Frederick Douglass was an amazing man who was born a slave. Even though he knew he would likely die if caught, he attempted to escape for freedom. On this third attempt, he was successful. He eventually met Garrison and they became good friends. Douglass was an eloquent, persuasive speaker. Many people tried to discredit him, saying that because he was a slave, he could not have been writing his speeches. Since people could not argue against his logic, they had to try to discredit him. (Something we still see to this day). While they were good friends, Garrison and Douglass had a falling out as Garrison advocated a peaceful resistance while other abolitionists wanted to lead Douglasa down a more militant path. They were able to become friends again later but were never as close as they once were. PBS “The Abolitionist” follows the story and lives of these two friends and their contact with others in the Abolitionist movement. After the civil war both these men continued down a similar path of fighting for the rights of women to vote. While several women had worked very hard to help end slavery, many male abolitionists would not support the women’s cause. When a group of women wanted to have a meeting to push for women’s rights, they invited many of the local abolitionist men, thinking surely they would understand. However, many of the men told their wives that saying women should have the right to vote was an embarrassment to their families. The women organized a meeting at the local church but they were locked out by the church leadership. They had to pass a child though the window to get in the church. The one local abolitionist that showed up was Douglass. He supported their cause as they had supported his. In a similar fashion, after the Civil War, many abolitionists were invited to England to discuss how the transition from slavery should work. The women who helped in the movement also went but upon arrival were told by the English to sit in the balcony. They would be allowed to listen to the discussions but their input was not wanted and would not be allowed. Upon hearing this, Garrison went and sat in the balcony with the women. As he told the members in the meeting if the women were not participating neither would he. Years later for a demonstration for women’s rights in Georgia, Garrison went knowing there was a price on his head. He was grabbed and taken down Main Street with a noose around his neck. He obviously must have gotten away as he died at an older age. Vivian, I am so glad that I watched The Abolishionists last night. What struck me the most is the part Evangelicals played in the abolition of slavery. If only Evangelicals were as fervent today about social justice as they were then. I did find it interesting when they were targeting who to mail the liberator to they chose many pastors at southern churches. They are — they just have a different definition of it than you do. It is my understanding that the movie “Lincoln” makes no reference to Frederick Douglass, which is interesting considering his role in abolition.